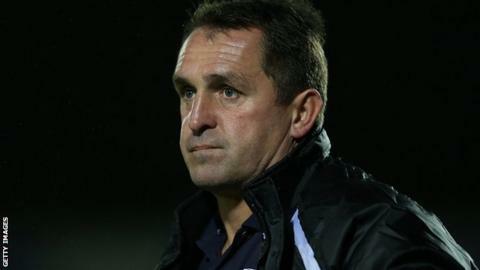 Gillingham boss Martin Allen says they have no scouting report for their FA Cup tie against Scunthorpe because their scout has joined their opponents. Russ Wilcox was appointed to the coaching staff at the League One side this week as assistant to Brian Laws. Allen told BBC Radio Kent: "Our scout that went and watched them last Saturday has just got the job of first-team coach at Scunthorpe. "So we haven't got a report on Scunthorpe. We know nothing." He added: "Russell Wilcox is a good friend of ours and had not been working. "We pick people that are not working in football, that have been managers and coaches, and we try to help them. "We asked Russ if he would do some scouting for us. He's been doing all the team preparation from up north. "He watched Scunthorpe and now we've got no scouting report. "I can't wait to see him." However Allen believes that his Gillingham side, who currently lie five points clear at the top of League Two, should not suffer too much despite not having as much information as usual on their opposition. "We're the underdogs anyway," he continued. "They're in League One and we're just Gillingham in League Two. "I don't want to scare the players about what we are up against so we'll just do what we normally do and prepare the best we can. "We'll remind our players that if they play as a unit, they will win. It's exactly the same with a scouting report or without a scouting report. "It doesn't matter about [opposition] players, managers or scouting reports. It's what we do that's important."